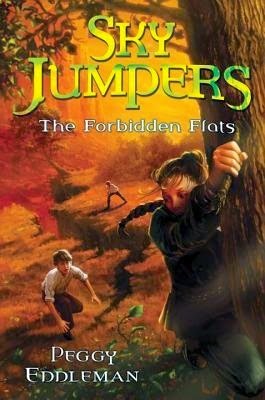 Sky Jumpers: The Forbidden Flats, a Whitney Award finalist this year in the middle grade category, is a worthy sequel to the initial Sky Jumpers novel, a Whitney Award finalist last year. A massive earthquake has shifted the geological formations around White Rock, releasing a gas that, though not toxic in itself, bonds to the deadly Bomb's Breath - the residual from the green bombs that destroyed the world in the war. The band of poisonous gas starts dropping, just a few inches a day at first but at an accelerating rate. Once again, twelve-year-old Hope has to use her talents, courage, and willingness to take huge risks in order to save her hometown. The Forbidden Flats effectively expands the world that Peggy Eddleman started to build in Sky Jumpers. As Hope and other citizens of White Rock travel further afield in search of the antidote to the falling Bomb's Breath, they interact with survivors in other settlements and discover new inventions, new perspectives, and new friends. And Hope is able to learn more about her birth family as well. As with the first book in the series, messages about the importance of appreciating different strengths and using your own talents and gifts to the best of your ability shine through. "What this world needs is people to invent, and people to discover." Neither ability is pre-eminent; both are needed. Personal responsibility is another recurrent theme. At the age of twelve, Hope is expected to make good and wise decisions, regardless of the choices of those around her, even adults. Hope's willingness to take risks saved her town before and is one of the reasons she is chosen for this task as well, but she starts to understand that while "sometimes you have to take a risk...maybe not every risk was a good one." The Sky Jumpers series has started out with two engaging stories. I look forward to the third and beyond!